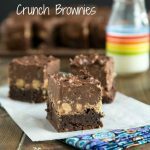 Peanut Butter Crunch Brownies - A fudgy brownie, topped with a layer of peanut butter cups, and then a layer of chocolate/peanut butter crispy fudge. Pure chocolate and peanut butter heaven! In a bowl combine melted chocolate with canola oil. Add sugar, and eggs. Mix until well combined. Stir in flour and salt. Pour batter into prepared pan. Bake for 25 minutes, until a tester comes out mostly clean. Remove from oven and immediately sprinkle peanut butter cups over the brownies. Let sit for 5 minutes, then gently use the back of a spoon and spread the melted chocolate over the brownies. Let cool completely. In a microwave safe bowl melt together chocolate chips, peanut butter and butter; heat for 1 minute, stir. Heat at 15 second intervals until smooth. Stir in vanilla and cereal. Pour over brownies. Place in fridge to completely set up before serving.